St. Luke’s Reach Out and Read program has received a $60,000 grant from a Donor-Advised Fund at the Carbon County Community Foundation. 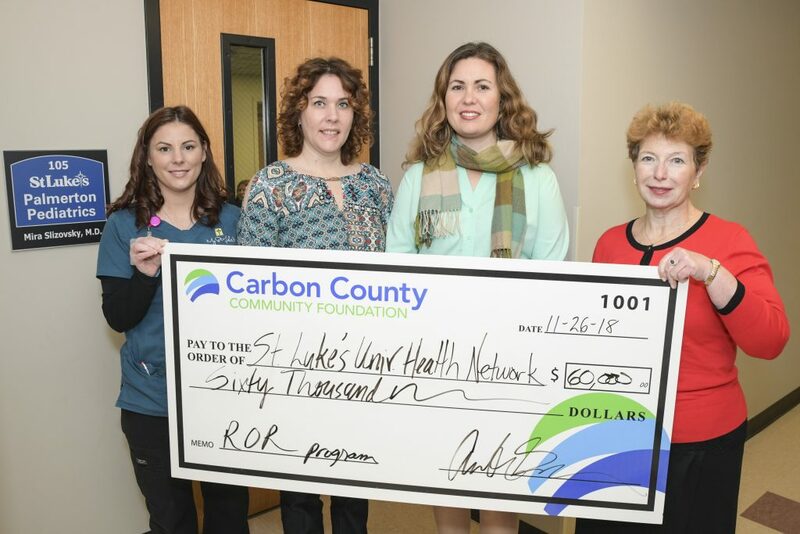 St. Luke’s University Health Network, a longtime partner of Reach Out and Read, will use the money to help meet the literacy needs of pediatric patients in Carbon County. “We’re proud and honored to act on behalf of a donor who understands the power of literacy and wanted to make a meaningful impact on the lives of children here in Carbon County,” said Amber Breiner, Executive Director of Carbon County Community Foundation. Donor-Advised Funds at the Community Foundation present a simple and cost-effective way for people to give strategically to the causes they care about most and receive as little or as much recognition as desired. Reach Out and Read (ROR) prepares America’s youngest children to succeed in school by training doctors and nurses to advise parents about the importance of reading aloud and by giving books to children at checkups from 6 months through 5 years. Through Reach Out and Read, each child starts kindergarten with a home library of up to 10 new, carefully chosen books and a parent who has heard at every health supervision visit about the importance of books and reading. “This project has the potential to impact 1,500 children ages 6 months to 5 years in Carbon County in one year,” said Rosemarie Lister, Community Health Liaison for SLUHN. Participating practices are: Palmerton Pediatrics, Lehighton Family Practice, Nesquehoning Primary Care and Nesquehoning Rural Health Center. Healthcare providers attend a one-hour continuing medical education course online on how to instruct parents on techniques for reading aloud to their children and the importance of making reading a fun part of daily life, Lister said. The program emphasizes teaching families how to enjoy looking at board books and naming pictures with infants, the importance of using rhyme and repetition with toddlers, and asking open-ended questions when reading with preschoolers. ROR not only encourages reading, but singing, talking and playing as well. Also, as part of the grant, St. Luke’s Community Health will be providing books and materials that promote oral health literacy as Carbon County is located in a dental health provider shortage area. ROR provides an opportunity to align with the American Academy of Pediatrics Brush, Book and Bed Program where families can learn more ways to value oral health through fun and engaging reading. Reach Out and Read was founded in 1989 with its first program at Boston City Hospital (now Boston Medical Center). By 2001, dramatic growth brought the Reach Out and Read model to all 50 states, with almost 1,500 sites distributing 1.6 million books per year. Today, Reach Out and Read partners with more than 5,800 program sites and distributes 6.9 million books per year. The program currently serves one in four children living in poverty in this country. Interested in Donor-Advised Funds at CCCF?